I've seen contests like this going around and even participated in one. They are alot of fun and usually bring the community together for some creative brainstorming! So i want to start my own monthly meme contest for every month in 2018. Hopefully i will be able to grow the 1 Steem reward to higher amounts in following months. The contest is quite simple, the community will upvote the meme they think deserves 1 Steem. The highest upvoted comment containing an original meme Wins! The communtiy should look for and upvote the memes they themself find funny and original. The reward will be transfered 1 week after the initial contest post. To enter the contest simply create an original meme and comment it on this post! 1 meme per comment to qualify for the contest. Only your imagination is the limit for topic of your meme! Bill could win 1 Steem! 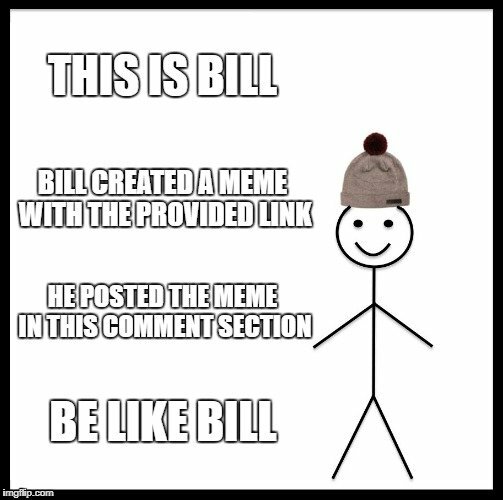 You go Bill! Good luck and may the odds be forever in your favor!